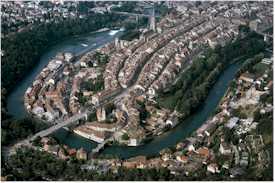 ABOVE: Bern's Onion Market takes place in the medieval city center, which is surrounded by the River Aare. INSET BELOW: Strings of onions at the Zibelemärit. On the fourth Monday of November, the Swiss capital of Bern hosts its yearly Zibelemärit or Onion Market. During the one-day festival, Bernese citizens and visitors can buy plaited strings of onions and garlic, onion sculptures, winter produce, nuts, crafts, onion tarts, onion soup, and Glühwein (hot mulled wine) from more than 700 stalls. As darkness falls, the streets of central Bern erupt with partying that includes confetti battles, street jesters, and locals in onion costumes. The Zibelemärit dates back to the mid-19th Century, when the new railroad made it easy for farmers to bring their onions into the city, but it has its roots in a two-week autumn market that began in the 1500s. One legend claims that the original market was created as a reward to farmers who helped the Bernese clean up after a city fire in 1405. The Onion Market takes place in the city center, with stalls concentrated in the area between the railroad station and the Bundesplatz. The market opens at the crack of dawn and continues into the evening. Vendors and shops sell ammunition for the Konfettischlacht, which begins at 4 p.m. and is open to warriors of all ages. For more information, see Bern Tourism's Onion Market page. We also suggest reading "When Bern is one big onion" by Diccon Bews (a British resident of Bern who has written several books about Switzerland). The Onion Market is the biggest public event of the year in Bern, drawing tourists from throughout Switzerland. Fortunately, Bern is easy to reach by train, and the Swiss Federal Railways add special trains to handle the crowds. Many Swiss travel agencies offer bus excursions, but we'd suggest going by rail. If you're planning to drive, you might want to consider parking in a nearby town and going into the city by train or bus. Top photo © Switzerland Tourism. Inset photo © Michael Blackburn.